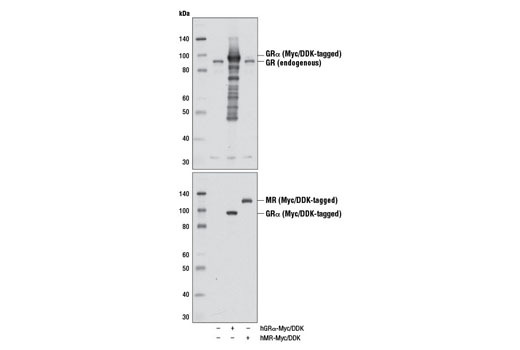 Western blot analysis of extracts from 293T cells, either mock transfected (-) or transfected with a construct expressing Myc/DDK-tagged full-length human glucocorticoid receptor-α (hGRα-Myc/DDK, +) or Myc/DDK-tagged full-length human mineralocorticoid receptor (hMR-Myc/DDK, +), using Glucocorticoid Receptor (D8H2) XP® Rabbit mAb (upper) and DYKDDDDK Tag Antibody (Binds to same epitope as Sigma's Anti-FLAG® M2 Antibody) #2368 (lower). 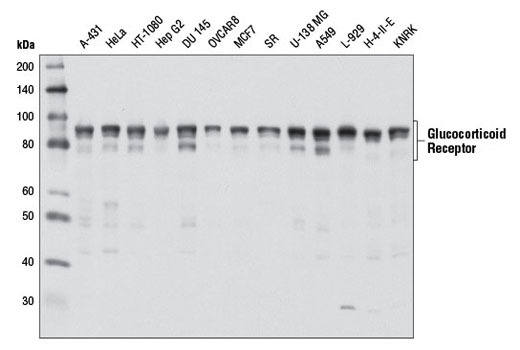 Western blot analysis of extracts from various cell lines using Glucocorticoid Receptor (D8H2) XP® Rabbit mAb. 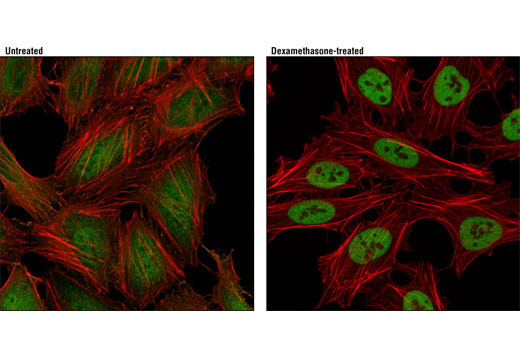 Confocal immunofluorescent analysis of HeLa cells, grown in phenol red-free media containing 5% charcoal-stripped FBS for 2 days and either untreated (left) or dexamethasone-treated (100 nM, 2hr; right), using Glucocorticoid Receptor (D8H2) XP® Rabbit mAb (green). Actin filaments were labeled with DY-554 phalloidin (red). Human whole blood was fixed, lysed, and permeabilized as per the Cell Signaling Technology Flow Alternate Protocol and stained using Glucocorticoid Receptor (D8H2) XP® Rabbit mAb (blue) compared to Rabbit (DA1E) mAb IgG XP® Isotype Control #3900 (red). Anti-rabbit IgG (H+L), F(ab')2 Fragment (Alexa Fluor® 488 Conjugate) #4412 was used as a secondary antibody. Samples were gated on CD3+ lymphocytes. A549 cells were cultured in media with 5% charcoal-stripped FBS for 3 days and then either untreated (left panel) or dexamethasone-treated (100 nM, 1 hr; right panel). 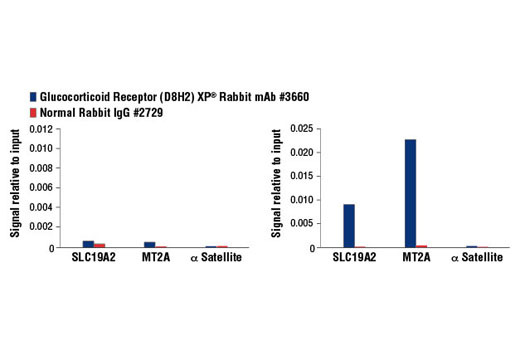 Chromatin immunoprecipitations were performed with cross-linked chromatin and Glucocorticoid Receptor (D8H2) XP® Rabbit mAb or Normal Rabbit IgG #2729 using SimpleChIP® Enzymatic Chromatin IP Kit (Magnetic Beads) #9003. The enriched DNA was quantified by real-time PCR using SimpleChIP® Human SLC19A2 Promoter Primers #7681, human MT2A promoter primers, and SimpleChIP® Human α Satellite Repeat Primers #4486. The amount of immunoprecipitated DNA in each sample is represented as signal relative to the total amount of input chromatin, which is equivalent to one. Glucocorticoid Receptor (D8H2) XP® Rabbit mAb recognizes endogenous levels of total glucocorticoid receptor protein. Based upon sequence alignment, this antibody is predicted to cross-react with all known alternative translation start site generated isoforms of glucocorticoid receptor-α and glucocorticoid receptor-β. This antibody does not cross-react with mineralocorticoid receptor. Monoclonal antibody is produced by immunizing animals with a synthetic peptide corresponding to residues surrounding Leu378 of human glucocorticoid receptor protein. Glucocorticoid hormones control cellular proliferation, inflammation, and metabolism through their association with the glucocorticoid receptor (GR)/NR3C1, a member of the nuclear hormone receptor superfamily of transcription factors (1). GR is composed of several conserved structural elements, including a carboxy-terminal ligand-binding domain (which also contains residues critical for receptor dimerization and hormone-dependent gene transactivation), a neighboring hinge region containing nuclear localization signals, a central zinc-finger-containing DNA-binding domain, and an amino-terminal variable region that participates in ligand-independent gene transcription. In the absence of hormone, a significant population of GR is localized to the cytoplasm in an inactive form via its association with regulatory chaperone proteins, such as HSP90, HSP70, and FKBP52. On hormone binding, GR is released from the chaperone complex and translocates to the nucleus as a dimer to associate with specific DNA sequences termed glucocorticoid response elements (GREs), thereby enhancing or repressing transcription of specific target genes (2). It was demonstrated that GR-mediated transcriptional activation is modulated by phosphorylation (3-5). Although GR can be basally phosphorylated in the absence of hormone, it becomes hyperphosphorylated upon binding receptor agonists. It has been suggested that hormone-dependent phosphorylation of GR may determine target promoter specificity, cofactor interaction, strength and duration of receptor signaling, receptor stability, and receptor subcellular localization (3). Yamamoto, K.R. (1985) Annu Rev Genet 19, 209-52. Necela, B.M. and Cidlowski, J.A. (2003) Trends Pharmacol. Sci. 24, 58-61. Wang, Z. et al. (2002) J Biol Chem 277, 26573-80. Rogatsky, I. et al. (1998) J. Biol. Chem. 273, 14315-14321. Krstic, M. D. et al. (1997) Mol. Cell. Biol. 17, 3947-3954. Anti-FLAG is a registered trademark of Sigma-Aldrich Biotechnology.